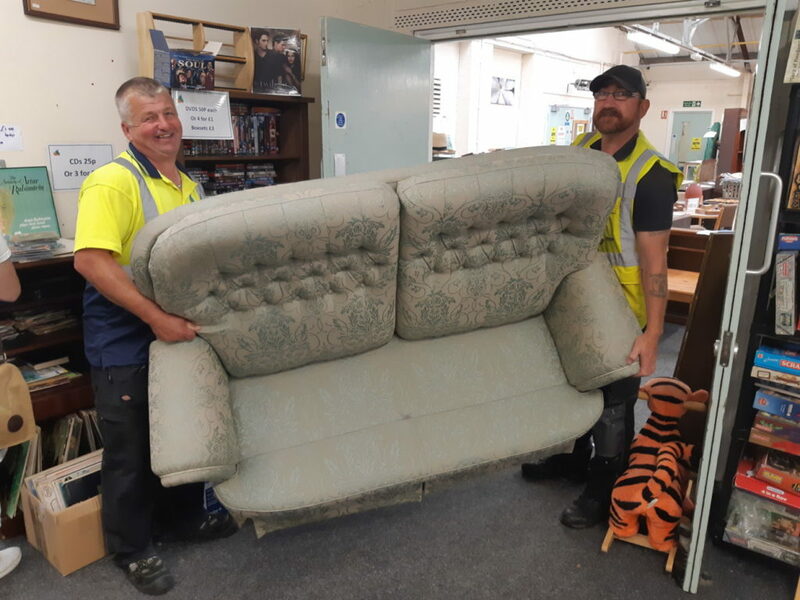 Crest Co-operative’s team of drivers will collect unwanted furniture and household electrical items from the homes of residents across the Conwy county. Call us on 01492 596 783 to find out more. We offer free collections of good quality items of furniture. Crest Co-operative will visit your home to assess your unwanted item/s. If the item is deemed unsuitable for re-sale, we offer a recycling collection service for a fee. For more information on our recycling fees please call us. Crest Co-operative welcome donations of all kinds of electrical items – if we can reuse an electrical item rather than recycle it we’ll see that your pre-loved goods find a new home. We unfortunately have to charge to collect most household electrical items, and they vary. Please call us for more details about the collection of electrical items. I live in a flat, can you still collect my unwanted items? Yes! If the driver says the item is unsuitable for re-sale and I do not wish to have my item collected, do I have to pay a call out fee? No – you’re not obliged to pay if you don’t want to. Where do you collect? We collect along the coast inside of the Conwy County, call us for more details. How long does it take to arrange a collection? Please arrange your collection a week to a fortnight in advance. Please call 01492 596783 to arrange your collection. Crest Co-operative is the official Conwy County Borough Council contractor for the collection and recycling of textiles and small electrical items. 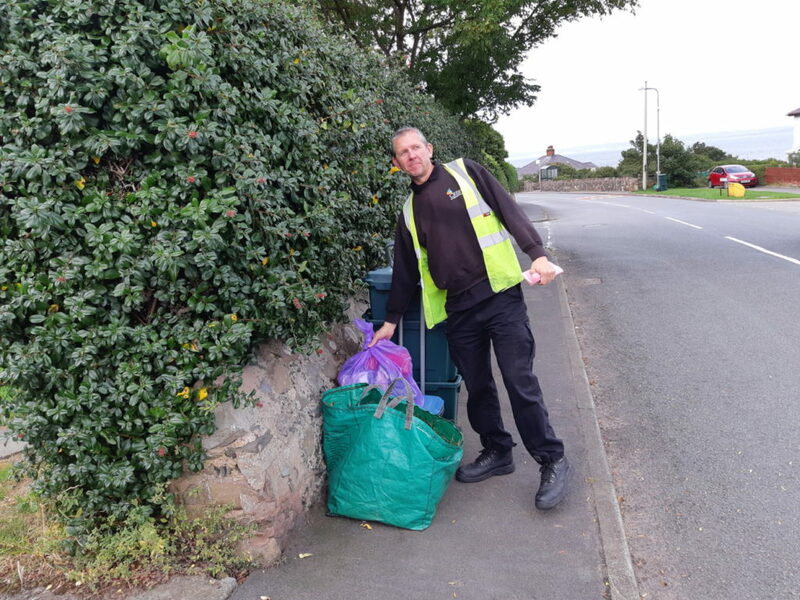 Our drivers collect unwanted items in brightly coloured bags from 55,000 homes across the Conwy county. 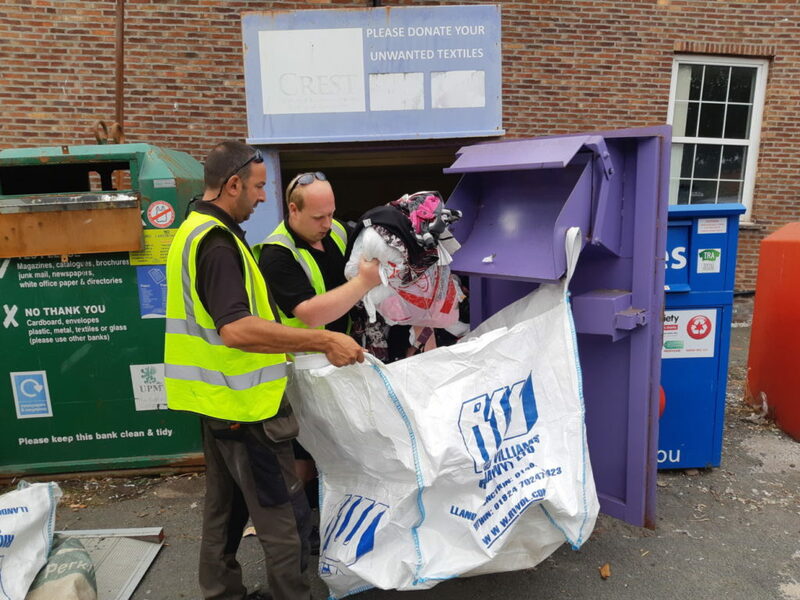 Textiles and unwanted clothing are collected in purple bags. Small electrical items, including hair dryers, toasters, irons and other electricals are collected in pink recycling bags. For more information on other recycling services offered through Conwy County Borough Council please click here. If it’s got a plug or a battery and it fits in the pink bag, we’ll take it: Mobile Phones, MP3/CD/DVD players, Laptops, Games Consoles, Electronic Toys, Hair Dryers/Straighteners, Kettles, Toasters, Irons, Radios, Shavers, Electronic Toothbrushes, Power Tools, Kitchen Blenders. Leave it out by 7am on your garden waste collection day. Recycle your clothes, shoes, accessories and more and support your local community. Crest Co-operative is the official local authority recycler for clothing/textiles and small electrical items. We currently have 27 clothing banks located in the Conwy area. They are situated in supermarkets, residential areas, schools and community group car parks across the county. Many of these banks support local schools and community groups. Items we can accept: Children’s Clothing, Adult’s Clothing, Paired Shoes(In any condition), Handbags, Belts, Bed Linen, Curtains, Towels. Items we cannot accept: Pillows, Duvets, Wet/Soiled Items, Bric a Brac. In addition to our textile banks we also have four small electrical item banks located in the area. These banks can be used to donate any small electrical items that are electric or battery powered. Use the interactive map below to find a recycling bank close to you. Please note that where any Electricals bank is located, there is a Textiles bank also in situ. The blue markers on the map indicate textile banks and the yellow markers indicate small electrical item (WEEE) recycling banks.